This is the second annual TechCrunch Include Progress Report. Covering diversity and inclusion in the tech industry cannot be done in a vacuum. As aspects of identity are intersectional, so too should be the way in which media approaches its coverage of the tech industry. With each passing year, companies big and small release diversity data, highlighting the need for more inclusive hiring. As a media company, it is our job to report these stories through a diversity and inclusion lens. You can track our coverage here. Complementing our editorial coverage is a series of annual events produced by our outstanding events team. Our editorial and events teams work hard together throughout the year to bring you the most unique tech events that give startups from around the world a chance to pitch judges from the most prestigious venture capital firms. In 2017, TechCrunch added to its slate of global events, bringing together startup founders, developers, scientists and technologists. From our Disrupts, Hardware Battlefield at CES and the Crunchies to our inaugural Sessions and Battlefield X events, we set out to ensure that we had a diverse roster of speakers, judges and contestants. 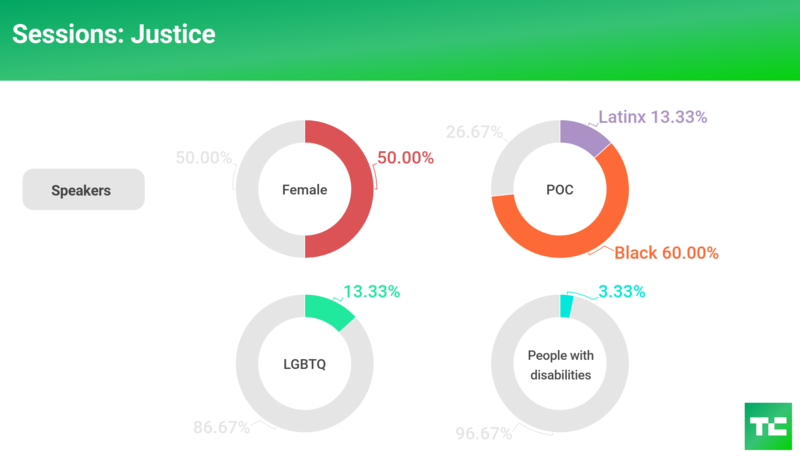 The importance of diversity and inclusion in the tech industry has generated much attention since we published our last Include Program progress report. At TechCrunch, we understand the importance of diversity, and it begins with hiring. In keeping with our commitments in the core principles and mission for Include 2016, we assembled the following progress report on our initiatives, staff and workplace culture. As in 2016, our methodology for collecting data on our event participants evolved. 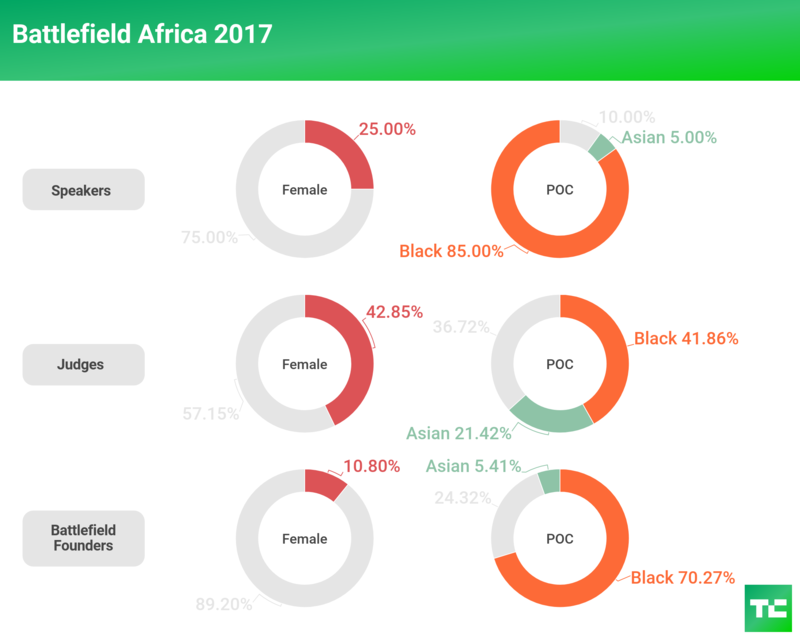 To date, we have tracked the gender and racial breakdown of our speakers, judges and Battlefield contestants through observed traits. In 2018, we will be implementing the use of anonymous, self-reporting surveys for all onstage participants in our events. In 2017, we hosted our TechCrunch Disrupt events in New York, San Francisco and Berlin. We continue to make strides in ensuring diverse attendance numbers in all facets of participation, from speakers, judges, Battlefield contestants and nonprofit groups. We also host groups of underserved and underrepresented students from local schools, sourced via local groups and representatives. For all Disrupt events, we offered a Battlefield Scholarship Fund, which we piloted in 2016, to offset the costs of participating in the program. Tickets to Disrupt have been and will always be free for Battlefield participants. Five teams applied and received financial support ranging from $200 to $7,000, which they used to cover airfare, housing and other associated costs. Finally, to mark the start of TechCrunch Disrupt, TechCrunch partners with organizations to host the Women in Tech(Crunch) event. This is a private event specifically for female speakers, female judges, Battlefield female founders and the TechCrunch editorial team. In addition to our Women in Tech(Crunch) event in each city, we also hosted Women of Disrupt Breakfasts, all of which included programming. 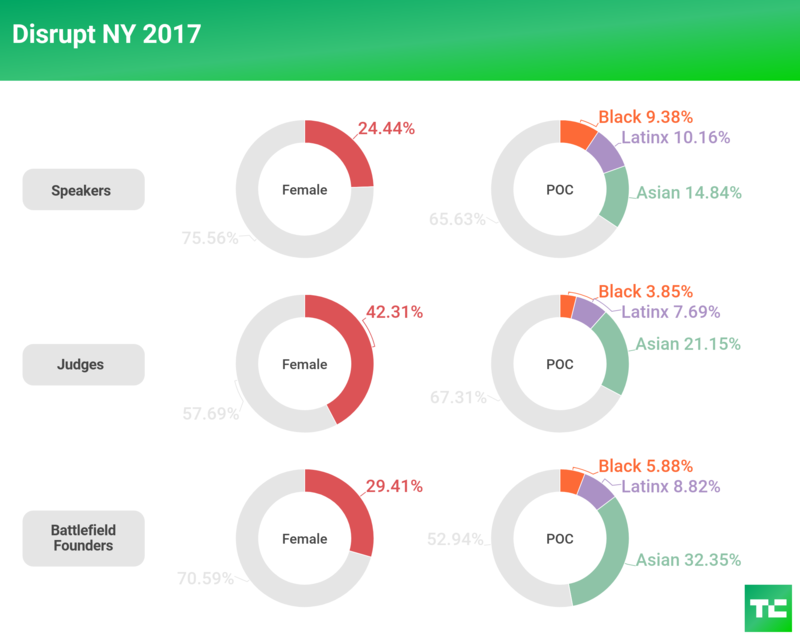 The number of women who appeared onstage at Disrupt New York in May 2017 improved over the prior year, with an increase in judges (6 percent) and Battlefield founders (8 percent). However, we saw 8 percent fewer female speakers. We made gains with racial diversity onstage in 2017, as well. 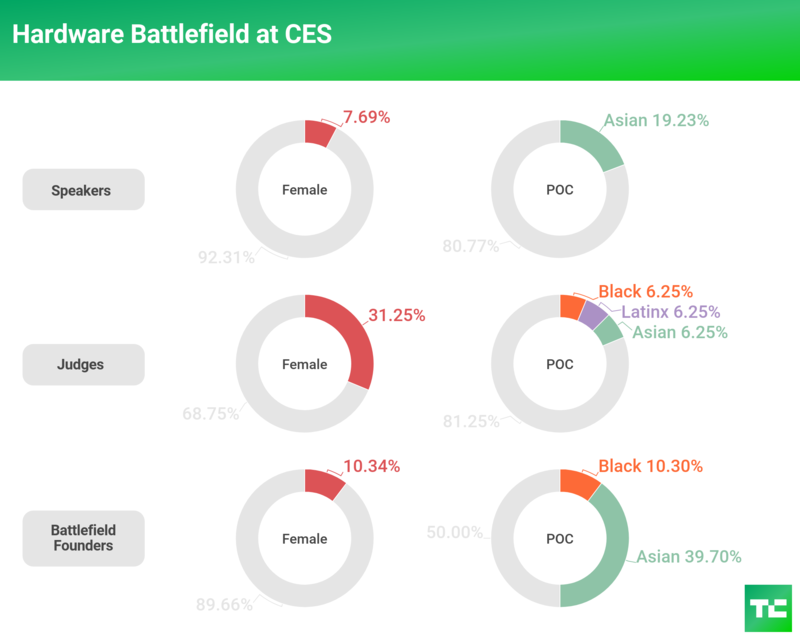 Speakers (5 percent) and Battlefield founders (18 percent) saw increases, but we had about 4 percent fewer judges who were people of color. We hosted 100 female founders, investors and TechCrunch staff at the Women in Tech(Crunch) event in partnership with General Catalyst . And with Live a Moment, we hosted 80 attendees at the Women of Disrupt Breakfast. Our efforts to ensure attendance from all groups included providing five free Startup Alley tables to nonprofits selected from a pool of more than 30 applicants through an open application process announced on TechCrunch. In addition, we provided a 90 percent discount on Disrupt tickets for students. Disrupt San Francisco 2017 in September would be the last time we decided to hold this event at one of the piers off the San Francisco Bay. This year, Disrupt SF will be held at Moscone West, the sheer size of which will require us to step up our inclusion efforts. In 2017, we saw an improvement over 2016 with female representation onstage, with speakers increasing 12 percent and judges increasing 13 percent. However, female representation on the Battlefield founder front decreased almost 6 percent. To help introduce students from underserved communities, we hosted 86 middle and high school students from Dev Mission, Bishop O’Dowd High School, Hack the Hood, Founders Bootcamp and Albany High School. Student groups were selected from an applicant pool of more than 35 student groups through an open application process announced on TechCrunch. We partnered with Greylock Partners to host 165 attendees for Women in Tech(Crunch). And for our Women of Disrupt Breakfast, Silicon Valley Editor Connie Loizos moderated a conversation with female founders from Away and Science Exchange and Alice, an artificial intelligence platform for women. We partnered with Intuit for this event that held 120 attendees. We also offered the same student ticket discount and free Startup Alley tables to nonprofits as we had in prior years; this year we expanded on that effort. Disrupt returned to Berlin in December 2017 after three years in London. We saw a 14 percent increase in female judges onstage over 2016. But female speakers and Battlefield founders decreased year-over-year by about 3 percent and 12 percent, respectively. As part of our inclusion efforts, we hosted 32 refugees learning at the ReDI School of Digital Integration. They brought a group of 30 students who had the opportunity to explore Startup Alley, listen to our speakers on the main stage and have an intimate conversation with Slack co-founder, Cal Henderson. We also supported some of the Battlefield companies with our scholarship fund and continued the student ticket discounts. Factory Berlin helped us host 65 attendees at our Women in Tech(Crunch) event. In addition, we hosted 80 attendees at the Women of Disrupt Breakfast. In January 2017, we once again hosted a Hardware Battlefield at CES. 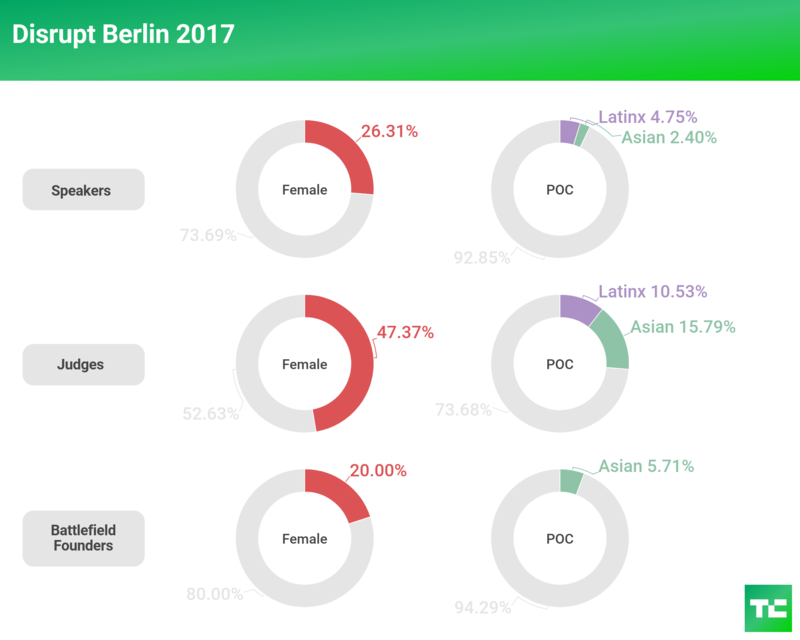 Female representation for speakers, judges and Battlefield founders were down slightly from 2016. 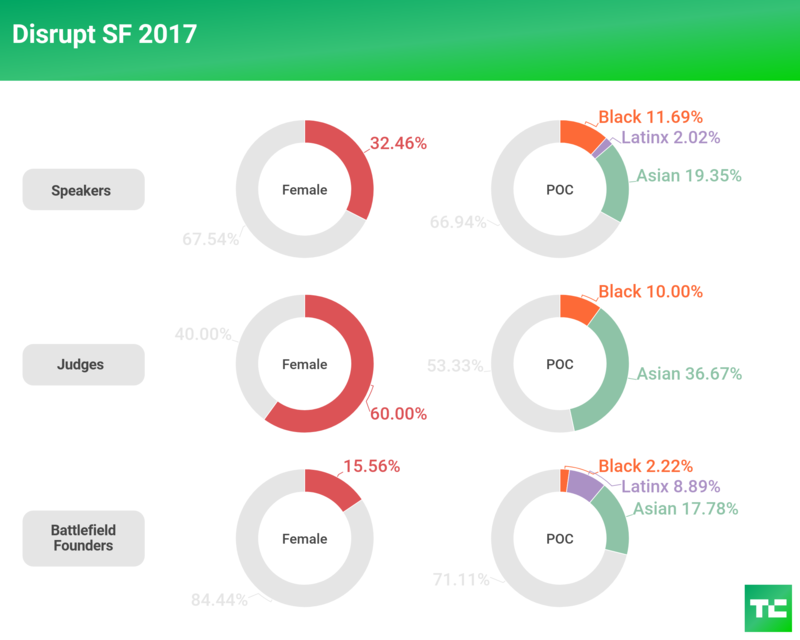 By contrast, for the first time in a Hardware Battlefield, minority founders were represented equally, with 50 percent. Building off of the overwhelming success of Disrupt Battlefield, we decided to spin it out into its own event and give it a new name: Battlefield X. In 2017, we sent teams to Africa and Australia with the intent to showcase startups doing amazing work in their respective corners of the globe. For the competition in Nairobi in October, we specifically looked for companies targeting social good, productivity and utility, and gaming and entertainment. Sub-Saharan African startups are helping unleash the region’s potential, from last-mile technologies that deliver edtech, agtech and medtech to remote areas, to mobile-based fintech innovations that ease financial transactions and lending in bustling cities. 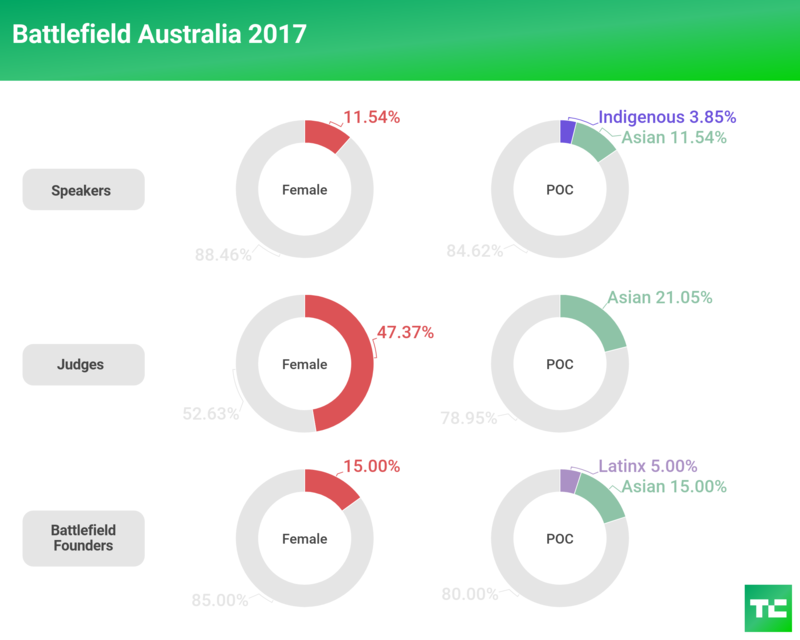 To bring Battlefield to Australia in October 2017, TechCrunch partnered with the ELEVACAO Foundation, whose mission to empower women tech entrepreneurs globally aligns with TechCrunch’s Include program to encourage more diversity in tech. We are also joining forces with Founders for Founders, a group dedicated to supporting tech entrepreneurs across Australia, and Hoist, which is promoting innovation through collaboration between entrepreneurs and corporates. Last year we debuted Sessions, our new one-day events that dive deep on a single topic, bringing together experts in the field and those interested in the theme. With these events, we intend to drop the barrier between speaker and attendee to allow for plenty of interaction with networking time and a big reception at the end of each day. Our very first event was Sessions: Justice in June followed by Sessions: Robotics in July. During the one-day event in June around diversity, inclusion and justice in tech, we heard from social justice activist DeRay Mckesson, Uber Global Head of Diversity and Inclusion Bernard Coleman, Salesforce Chief Equality Officer Tony Prophet, Safety Pin Box co-founder Leslie Mac, The Last Mile co-founder Chris Redlitz, CryptoHarlem founder Matt Mitchell and others. TechCrunch Sessions: Justice was the most racially inclusive event we’ve ever put on. That said, we could’ve done better with getting more Latinx speakers onstage. In addition, we collected statistics about gender and sexual orientation. Our aim with this one-day event, which was hosted at MIT in July, was to bring together the key players in robotics. MIT CSAIL, iRobot, CyPhy, DARPA and Mass Robotics were represented. As you can see from the data below, we need to ensure higher numbers of women and people of color are represented. The 10th anniversary of the Crunchies was also the last. In 2017 we renewed our intention to showcase and reward the diversity across Silicon Valley and beyond. We gave Project Include the second-ever TechCrunch Include Award. The goal of Project Include is to make the conversation a lot easier to have. Led by Erica Joy Baker, bethanye McKinney Blount, Tracy Chou, Laura I. Gómez, Y-Vonne Hutchinson, Freada Kapor Klein, Ellen Pao and Susan Wu, Project Include provides tools for tech CEOs to help foster working environments of inclusion for underrepresented groups. Launched in 2014, TechCrunch’s Include program applies resources uniquely available to TechCrunch, including our editorial and events platforms, to create access and opportunity for underserved and underrepresented founders. TechCrunch Include Office Hours are a part of this effort. The program launched in October 2015. Each month, TechCrunch partners with a VC in New York or San Francisco to host private 20-minute sessions that are valuable opportunities for entrepreneurs to gain key insights and advice from seasoned investors. 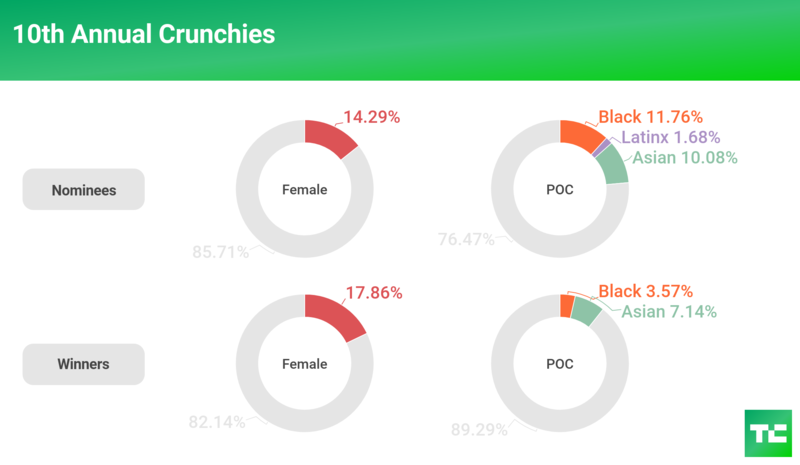 Beginning last year, TechCrunch made it a priority to improve our recruiting and hiring in order to make our workplace more diverse, and we will continue to do so. With respect to gender representation, TechCrunch is ahead of typical tech companies. Compared to internet-based media companies, however, the TechCrunch editorial staff is in the range of most other publications, with women holding about 27 percent of newsroom jobs. This is far from where we aim to be. We have the most work to do, however, in the area of racial diversity, where we are more than 80 percent white on the editorial staff and 78 percent white across all company departments. As the issue of diversity and inclusion in tech continues to command conversations all over Silicon Valley and beyond, it will remain at the forefront of our coverage and around the world at our events. With contributions from Alexandra Ames, director of marketing, and Neesha Tambe, Battlefield and CrunchMatch manager.